Most of the Chechen live in the remote valleys of the Caucasus Mountains of southern Russia between the Caspian Sea and the Black Sea. They are a strong, determined people with a long history of fighting for their freedom. During the first half of the twentieth century, the Soviets dominated the Chechens. The Soviets introduced property ownership by society, but the Chechens held to land ownership by clan. As a result, the Chechens fiercely opposed Soviet rule. In World War II, most Chechens opposed the Germans and fought alongside the Red Army. Nevertheless, in 1944, many of the Chechens and also their neighbors, the Ingush, were deported to various parts of central Asia, including Kazakstan. Although they were allowed to return in 1968, many were already settled in their new land. On October 27, 1991, the Chechens declared their independence. Since then, Russian troops have invaded Chechnya, and much of that nation now lies in ruins. The Chechens span a variety of occupations and income levels. Most are farmers who grow grains, vegetables, or fruit. Others raise stock, particularly fine-fleeced sheep. Still others work in oil refineries. Chechen women work outside of their homes daily, as do other women in the former Soviet Union. The core of Chechen society is the taip, a clan-like organization whose members descended from a common ancestor. A group of elders with its own court rules each taip. In marriage, the Chechens generally choose mates from outside their own clans. Marriage between blood relatives within a span of three generations is forbidden. The groom's family pays a dowry to the bride or her family as a guarantee against divorce. Traditionally, a Chechen wife could not eat with her husband or speak to his relatives. Her role was simply one of submission. Kazakstan dominates Central Asia and the trade routes between the East and West. It was a member of the USSR from 1936-1991, and the people re-elected the Communist Party after their independence in 1991. Kazakstan is bounded on the west and north by Russia; on the east by China; and on the south by Kyrgyzstan, Uzbekistan, and Turkmenistan. Ruins of church buildings in Kazakstan indicate that at least some Chechen had converted to Christianity by the eighth century. However, during the sixteenth century, Islam was introduced by other peoples who settled among the Chechens. By the late seventeenth century, all remaining ties to Christianity had vanished from the region. The role of the numerous holy places of pilgrimage in Kazakhstan is less significant than in other parts of Central Asia where tribal structures remain strong. Yet the Chechens are very committed to their Muslim faith. A number of them have received religious training at Dagestan, an important Islamic center in the southern part of the Chechen-Ingush Republic. 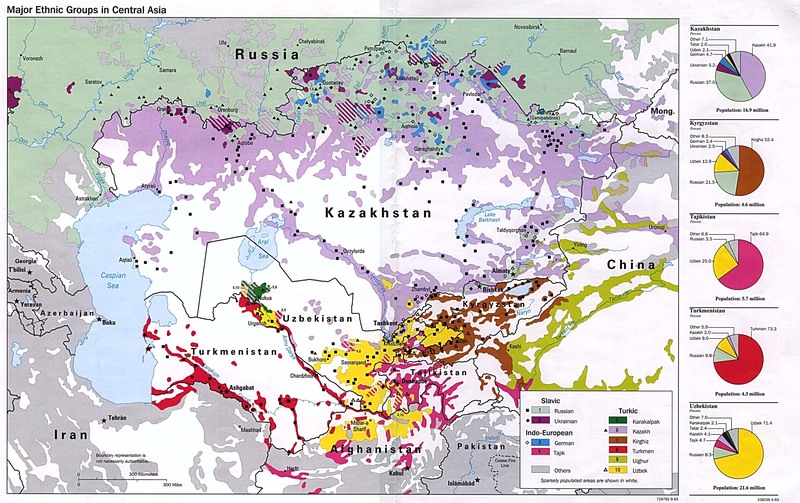 Kazakstan's cultural and religious diversity makes this land strategic for evangelizing most of the Central Asian peoples. Although the Communist suppression of religion has given way to greater toleration, the Chechens have had little opportunity to hear the Gospel. More Christian laborers and additional materials in their language are needed to see the Gospel take root in their lives. Physically, the drying up of the Aral Sea is causing increased concentrations of chemical pesticides and natural salts. In addition, the environment suffers from severe industrial pollution. Perhaps Christians with expertise in environmental issues will find opportunities to work among the Chechens and show them the love of Jesus in practical ways. Prayer is the first step toward seeing them reached with the Light of the Gospel. * Scripture Prayers for the Chechen in Kazakhstan. * Ask the Lord of the harvest to call full-time workers who will share Christ with the Chechens. * Ask the Holy Spirit to give creative ideas for evangelism to missions agencies focusing on the Chechens. * Pray that God will use loving Kazak Christians to minister the love of Jesus to the Chechens living among them. * Ask God to raise up intercessors who will stand in the gap for the Chechens. * Pray that strong local churches will be raised up among the Chechens.